Cyber crooks or anyone interested in coding now can try out ransomware using open source code. 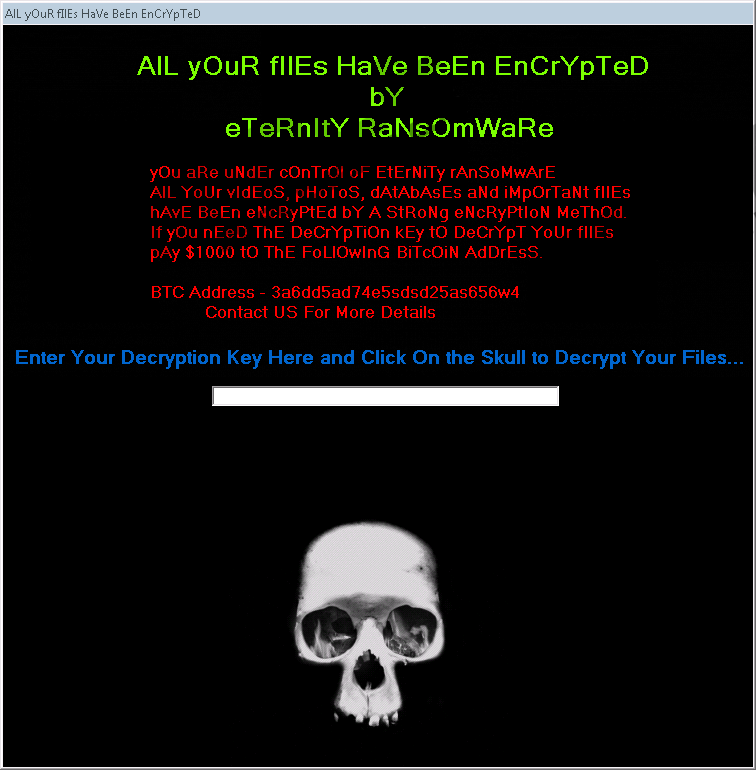 The Eternity ransomware is an open source code infection created by Sameera Madushan Perera and is aimed for educational purposes. On a website promoting this open source platform, the Eternity ransomware is presented as a tool for encrypting all files in a given location. The Eternity ransomware is written using the .NET platform and the Visual Basic programming language, which has recently gained in popularity among crooks interested in building open source code-based ransomware. If your computer has recently been affected by the Eternity rasomware, you should not panic but take action to remove the infection from the computer, and without a doubt, take measures to prevent similar incidents in the near future. Upon installation, the Eternity threat plays two audio files, which are named Audio1.wav and Audio2.wav. The first file plays a text informing the victim that the computer has been encrypted, whereas the second files plays a joke. An analysis of the threat has shown that the ransomware fails operating if the audio files are not in the same directory as the ransomware itself. The Eternity ransomware encrypts files in a directory named Test, located on the Desktop. Each encrypted file gets the extension .eTeRnItY, which is added to the extension that is already present on the file. Similarly to multiple other destructive ransomware threats, the Eternity ransomware demands for a ransom, which you should not pay if you do not have a Test directory which would contain some extremely valuable information worth the money. In any case, paying up is a waste of time and money because the crooks behind ransomware do not bother to help their victims restore the affected data. The belief that encrypted data will be restored has lead numerous victims to financial losses, and you should not become a statistic. According to the warning of the Eternity ransomware, you have lost your access to your video files, photos, and other valuable data, which is a typical introduction to the release fee. The Eternity ransomware demands a sum of $1000 in Bitcoin, which is now available at prices high as never before. A typical ransomare infection would demand a ransom that varies from $50 to $200 or $300; however, even these sums are not usually affordable to private users, but those who pay them usually gets disappointed by the fact that they do not get anything in return. In the present case with the Eternity ransomware, there is no need to even think about paying up because the infection can be decrypted. It has its simple decryption key, also known as unlock code, which can be used to decrypted the affected files. After unlocking files, it is not enough to leave everything as it is. Decrypting files is not equal to removing the threat. The Eternity ransomware should be removed from the computer, and the sooner you do it, the better. Before we move to the removal of the threat, you should beware of the ways of malware distribution so that you can minimize the risk of getting the PC infected. Ransomare is very often spread through email, so you should be careful with emails received from unrecognized senders. You should always stay away from freeware sharing websites because software builders tend to stealthily bundle malware with free desktop or browser applications. You should also be careful with clickable links and pop-up ads or advertising banners you encounter while on the Internet. Keeping the OS updated and protected is also highly important. Regarding PC security, you should not hesitate to implement a reputable security tool because only powerful antimalware can inform you about potential threats. If you determined to try removing the Eternity ransomware manually, the removal guide given below should help you do so. After you have removed the Eternity threat, consider scanning the system to find whether the system is at risk. Bear in mind that some other threats might be running in the background alongside the ransomware. Use the decryption key 1234567890. Delete recently downloaded files from the desktop, Downloads folder and %Temp% directory. Quick & tested solution for Eternity Ransomware removal.